Police in Panama say they have found bones and a pair of boots that could be the remains of two Dutch women who went missing more than two months ago. Lisanne Froon, 22, and Kris Kremers, 21, disappeared from the town of Boquete in early April. A backpack containing two mobile phones thought to belong to the women was found in the same area last week. Investigators say the finds are "significant" and that DNA tests will now be carried out on the bones. Police said the remains were found in Bocas del Toro province on Thursday. They are continuing to search the area where the items were found. The women had travelled to Boquete earlier this year to do social work with children after completing a two-week Spanish course. 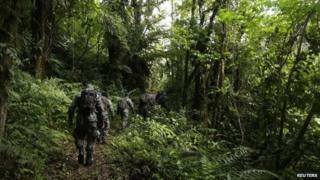 They were last seen on 2 April as they went walking along a mountain path in the densely wooded area along the border with Costa Rica. A Dutch search team travelled to Panama in May but did not manage to find the women. The parents of the women have offered a $30,000 (£18,000) reward for anyone providing "concrete information" about their whereabouts. Boquete is a popular destination for hikers exploring the nearby cloud forest, waterfalls and coffee plantations. In 2009, a 29-year-old British man disappeared from the town. He left all his belongings and only had with him his passport, credit card and a few dollars. While visitors are warned against travelling to Panama's eastern border with Colombia because of the presence of Colombian rebels in the area, its western border region is generally considered to be safe.